The Tall Ship at Glasgow Harbour is one of only five tall ships' to be built on the River Clyde in Glasgow and is the only one that is still based here. The ship's name is the S.V. Glenlee and after it was built in 1896 it then circumnavigated the globe four times transporting cargo around the world. The Glenlee was then purchased by the Spanish navy and in 1981, after being used as a training ship, was taken to Seville harbour where the Glenlee was forgotten. 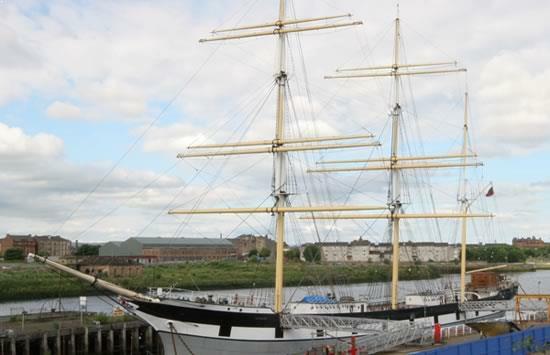 The Glenlee was then purchased by the Clyde Maritime Trust and restored over seven years. Since it's opening in 1999 the Tall Ship has attracted 30,000 visitors every year. Attractions within the Tall Ship include a museum charting the ship's history and restoration process. The Tall Ship also provides Kids Parties where you can hire a space on board and will be provided with Loot bags, refreshments, decoration packs and invitations. For a truly original party for your kids what more could you ask for. Different packages are available for schools including such things as guided tours, dressing up in period costume and even lunch can be provided. Take a look at there website or contact the Tall Ship for more details about school days out there. Finally enjoy the history and tradition of the Glenlee by hiring it for a function. Many different kinds of function can be catered for including meetings, receptions, corporate, weddings and seasonal events. With either the Main deck, the Tween deck or the Cargo hold to choose from there is sure to be enough space for your function. Food can be provided to suit any occasion. For more details on functions please contact the Tall Ship at Glasgow Harbour.